When my kids were little we would pull all our Christmas books and wrap them up–we would use the previous years wrapping paper scraps and wrap each book up and place them in a big basket. I would secretly wrap a few new books and throw them in the mix with the other books in the basket. 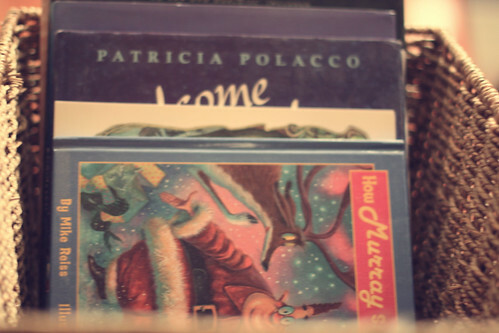 In December each night we would unwrap one book, each kid taking a turn, and we would cuddle up and read. 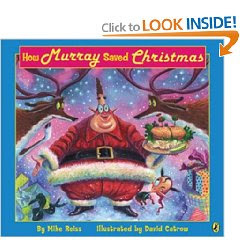 One of our favorites is How Murray Saved Christmas, by Mike Reiss. This is such a WONDERFUL idea. Maybe I will start this tradition when I have a family one day! what a great idea. i wish i could still do something like this. maybe i’ll do it with my niece and nephew (twins born on Christmas Eve) while they’re here – that’d be fun. i’ve never read any of these. but i love children’s books. i can’t wait to have kids of my own to read them to, especially at a magical time of year like this! what a magical photo you’ve taken here.